Rene Fernandez paints the west wall of Numbers Nightclub, June 5, 2014 in Houston. Fernandez says each portrait takes about two hours. Fernandez is a regular at the nightclub, and the musicians pictured represent the music played on Fridays, Classic Numbers night. The full line up of musicians in the mural are Trent Renzor, left, of Nine Inch Nails, Al Jourgensen of Ministry, Blondie, Joey Ramone, David Bowie, Ian Curtis of Joy Division, Morrissey, Siouxsie Sioux of Siouxsie and the Banshees, and Robert Smith of The Cure. Fernandez is creating the mural for free. 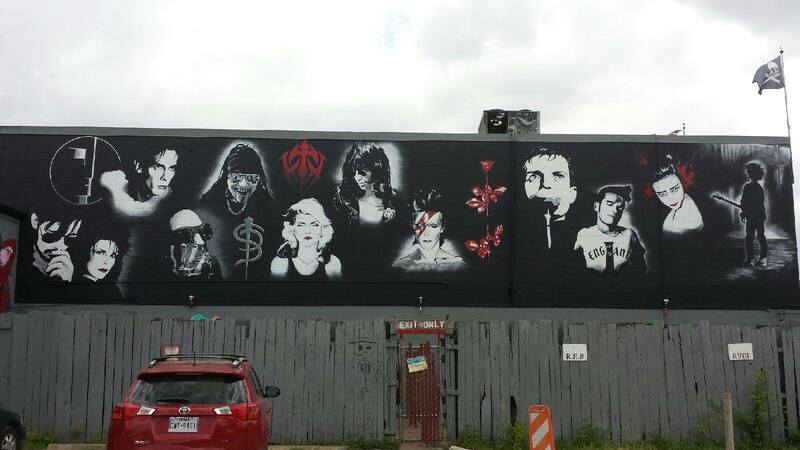 via Numbers’ mural recalls Morrissey, Bowie, Siouxsie – Houston Chronicle. Since The Texican last wrote about the new mural going up on the west side of Numbers in Montrose, there have been two new additions. Artist Rene Fernandez was finishing up the addition of the Kraftwerk logo onto the mural just this morning, right under the image of Bauhaus lead singer Peter Murphy and that band’s own logo. UPDATE: Strike that Teutonic vibe, as Kraftwerk has been replaced with the Sisters of Mercy late this week. Fernandez is hoping to incorporate the robots back in soon.Visiting Fernandez early this morning, his assistant said that all that is left is maybe one or two artists and some other embellishments to the mural, which you can see driving east on Montrose, just past Taft. You can now see the logos for My Life With The Thrill Kill Kult and Skinny Puppy too. Old-school goth heads in Houston are probably smiling at their work desks right about now. They have plans for the inside too, which they would only smile about.For what it’s worth, German techno heroes Kraftwerk never played Numbers during the venue’s 36-year history, or even Houston for that matter. After leaving Bauhaus in 1983, Murphy played the stage a handful of times, the last time in March 2011, in between Bauhaus reunion jaunts. The club would love to him back soon, they say. He plays Scout Bar in Clear Lake on July 31.
via Bauhaus and others added to the gestating Numbers mural – The Texican. WOW! Sweet! I wish we had anything that cool where I live.